And because you’re here, you’re already ahead of the game because you’re looking for solutions to bring to your campers. That’s where these cutting-edge and PROVEN bodyweight finishers come in. These 12 short, but powerful workout grand finales are perfect to end any of your favorite bootcamp workouts. You can even give any of these short mini-workouts (they only last a few minutes) to your campers because they require ZERO equipment. Test drive this Metabolic Finisher program for a full 8 weeks with absolutely NO RISK so you can see for yourself how much fat you can lose without ANY long, boring cardio. You are protected by my 100% Money-Back Guarantee. I guarantee you will be thrilled, amazed and addicted with these fat-burning workouts, or you can simply email me for a prompt and courteous, no hassles, no questions asked 100% refund. In fact, if you’re not completely happy for ANY reason at all, then I insist that you ask for a refund. However, after seeing thousands of men and women transform their bodies while becoming addicted to working out again, I’m confident you’ll be blown away at how efficient and powerful my metabolic resistance training programs can be. This removes ALL risks, you now have nothing to lose but ugly pounds of fat. P.S. There is NO RISK at all for you to try this Metabolic Finisher program. 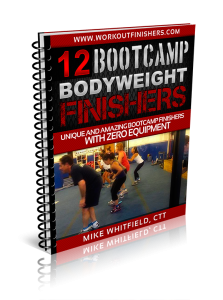 If you are not thrilled with Bootcamp Bodyweight Finishers in 60 days, let us know and we’ll refund every penny. Your satisfaction is 100% guaranteed. My workout programs have already been seen on Men’s Health, Turbulence Training and used by thousands of men and women, and I guarantee it will work for you, too. P.P.S. Start this addicting program today because I’m not sure how long I’m going to offer this unique metabolic resistance training program at such a low price. In fact, people have paid up to $39 to get access to this program!